When it comes to Ford electric and hybrid cars, no matter whether they’re operating in electric mode, gas mode or a combination of both, these vehicles optimize efficiency. And simplicity. The plug-in hybrid vehicles can be recharged in under three hours using a 240-volt outlet. While our all-electric EVs frees you from ever stopping at a gas station again. Unless it’s for a soda. The Ford with a fresh and refined new design front and rear, the 2019 Ford Fusion Hybrid car gains updated energy storage systems for faster charging and increased distance. Standard Ford Co-Pilot360 includes Pre-Collision Assist with Automatic Emergency Braking, Blind Spot Information System with cross-traffic alert, Lane-Keeping System, rearview camera and auto high-beam headlamps. Also standard Ford Co-Pilot360 Assist adds Adaptive Cruise Control with Stop & Go and voice-activated navigation with SiriusXM Traffic and Travel Link. Additional standard driver-assist features include app integration with Ford+Alexa and Waze compatibility through SYNC 3.
that come together for 188 combined horsepower and great gas mileage from its 2.0L iVCT Atkinson-cycle I-4 hybrid powertrain. 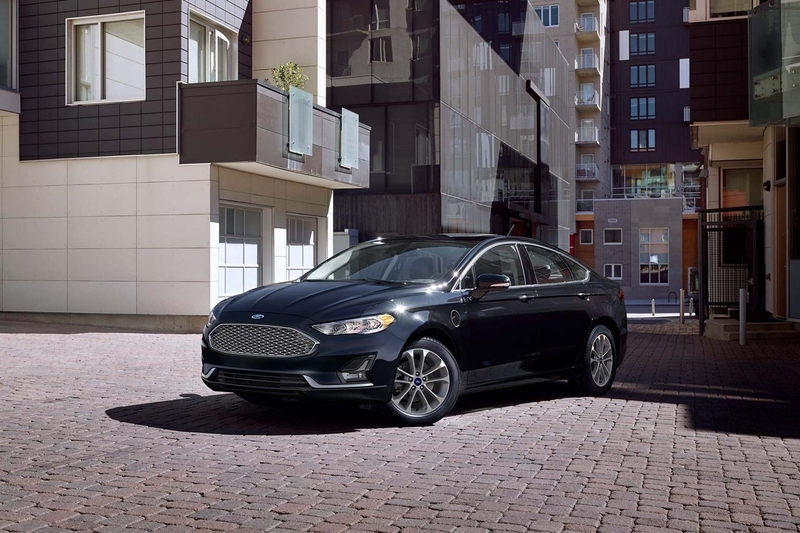 The 2019 Fusion Hybrid offers an EPA-estimated rating of 43 city/41 hwy/42 combined mpg. The big news for the 2019 Ford Fusion Energi is the upgraded with a 9.0-kilowatt-hour air-cooled lithium battery pack which allows it travel nearly 20 percent further on electric only than last year’s model. The Fusion Energi is outfitted with the Ford Co-Pilot360 suite of safety technologies that includes standard Pre-Collision Assist with Automatic Emergency Braking, Blind Spot Information System with cross-traffic alert, Lane-Keeping System, rearview camera and auto high-beam headlamps. Adaptive Cruise Control with Stop & Go and voice-activated navigation with SiriusXM Traffic and Travel Link are standard for Fusion Energi Titanium and available for other models. Additional driver-assist features available include new app integration with Ford+Alexa and Waze compatibility through SYNC 3. As a plug-in hybrid car, the 2019 Fusion Energi provides a choice of three modes that let you select gas, electric or a combination of both. You can even operate in all-electric mode up to an EPA-estimated range of 26 miles. And thanks to the Regenerative Braking System, kinetic braking energy is captured and stored in the battery for later use. The 2019 Fusion Energi offers an EPA-estimated rating of 43 city/41 hwy/42 combined mpg (EPA-estimated 109 city/97 hwy/103 combined MPGe). It’s powered by a 2.0L iVCT Atkinson-cycle I-4 hybrid powerplant. The 2018 Focus Electric has been the EV choice of our customers since 2011 – an affordable, fun-to-drive Ford electric car for families looking to make the change to an all-electric lifestyle. The 2018 Ford Focus Electric offers an EPA-estimated MPGe City/Hwy/Comb 118/96/107. Powered by a 35 kWh lithium-ion battery, the Focus Electric has impressive efficiency. And with regenerative braking that recovers and returns some of the lost energy to your battery, and your electric range can be increased. 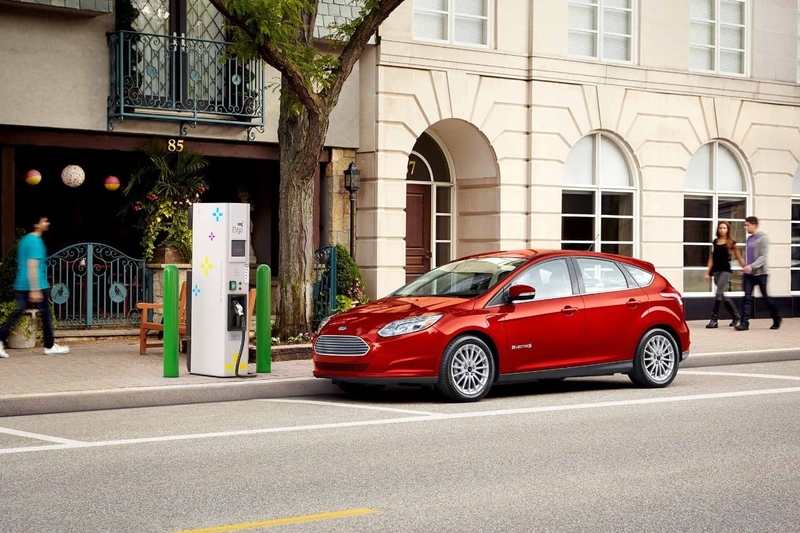 To learn more about Ford electric and hybrid vehicles, stop into any of your Southern California Ford Dealers for a test drive today.